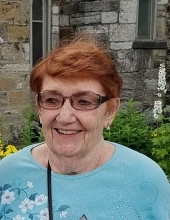 It is with great sadness that the family of Rosemarie T. (Keating) Roehl announces her passing on November 26, 2018 in Schenectady, NY. She was born to the late Edward and Marion Keating on April 30, 1930. Rosemarie is survived by three children Daniel (Margi), Thomas (Ellen), and Patrice. She is predeceased by her husband Jack and her son John. She is also survived by grandchildren Justin (Ashley) and Meghan Roehl and by sisters Mary Anne and Noreen and a brother, Terry (Noreen). Rosemarie and her sister Mary Anne celebrated a double wedding on January 2, 1956 with Jack and his best friend Bruce McDonnell. Rosemarie graduated as a Registered Nurse from St Mary’s Hospital, now connected to the Mayo Clinic in Rochester, MN. After graduation Rosemarie moved to San Francisco, CA and worked as a Registered Nurse for 4 years. She moved to Pittsburgh in 1964 and became an avid sports fan for the all the Pittsburgh teams. There will be visitation at the Jefferson Memorial Funeral Home, 301 Curry Hollow Road, Pittsburgh, PA 15236 on Sunday, December 2, 2018 from 2:00 PM to 6:00 PM. A Mass of Christian Burial will be held on Monday, December 3, 2018 at 10:00 AM at Saint Elizabeth of Hungary Parish, 1 Grove Place, Pittsburgh, PA 15236. In lieu of flowers, please send donations to: Saint Elizabeth of Hungary Parish. Online condolences may be left at www.jeffersonmemorial.biz. To send flowers or a remembrance gift to the family of Rosemarie T. (Keating) Roehl, please visit our Tribute Store. "Email Address" would like to share the life celebration of Rosemarie T. (Keating) Roehl. Click on the "link" to go to share a favorite memory or leave a condolence message for the family.